“The wicked flee when none pursueth.” (Proverbs 28:1). In the original novel by Charles Portis, the verse is quoted by Mattie Ross, the girl-heroine, in her dry narrator’s voice explaining the flight of Tom Cheney, the man who killed her father. Mattie is the revelation of this film, in every sense. She’s 14 years old at the time of the events, but the entire story is being narrated by her much older self (a classic Western motif). Mattie poises her unyielding Calvinist Presbyterian faith, her Sunday school answers, against the brutality, the strangeness, and the randomness of the Wild West. She is the gunslinger of Morality. Death stalks her world. From the opening scene where her father’s corpse lies in the falling snow (or is it ash? ), to the final scene beside a grave. From the three men hung in Fort Smith, to an ancient skeleton filled with rattlers. There is a dark-lining to the world, a world that itself becomes steadily more spectral as her journey leads her over the border of the settled lands (a river, of course) and into the Territories. The bare trees and snow. A final desperate, mortal, gallop where the world has faded to silver and stars. The triple hanging at the start is instructive, the three men step forward to give an account of their lives, one repentant, one not, one silenced before speaking. Death comes to all simultaneously while the sheriff sits and looks bored. But Mattie’s belief and her quest appear to triumph against this. She is harder than stone, a truth only emphasised by her disquieting and occasional lapses into childishness. If No Country for Old Men was driven by Anton Chigurh’s unstoppable brutality, then this film is driven by Mattie Ross’ unbending sense of righteousness. She transforms a mean drunk and a vain Texan into her champions, and she cajoles, hounds, rides them forward. Eventually they become heroes. But the film doesn’t end. Guns have recoil. And so does this story. A one-armed loveless spinster, side-show freaks, narrowly missed connections. A world moved on and indifferent. Another piece of ambiguous wisdom from Mattie Ross, a leaning juxtaposition of necessity and… what? What is God’s grace, in this world of brutal vengeance and hard justice? 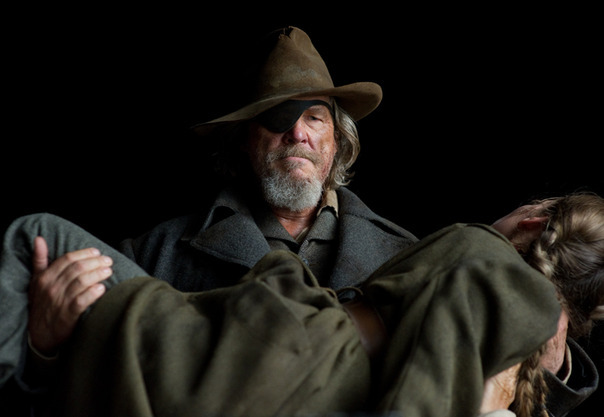 LaBeouf makes the shot, Rooster Cogburn makes the shack, but everyone pays for it one way or another. This can’t be grace then. Certainly Mattie wouldn’t have said so. What is grace, strict Calvinist, other than the final unshackling of morality from necessity? The spectre that has ever haunted Augustinian thought, that in the final judgement, grace might be indistinguishable from randomness, the final undoing of morality. You don’t have to read True Grit that way, but you can. And the possibility is intended. And if you do, True Grit is the end of the West. Next Post What it means to preach. Thanks Dan, you’ve raised my appreciation and reading of the film up a notch. I read that review a while ago. It really whet my appetite for the movie. I don’t quite agree with all Fish’s reading but his understanding of the role of grace in the movie was great. Thanks for the link, it’s a good resource. I can only applaud. And (after the cheering dies down) wonder: Have we understood or misunderstood grace if we find it threatens to undo morality in the end? Thoughts, Dan? Yes, almost certainly, we’ve misunderstood it. The problem comes with viewing grace as primarily an action ‘after the fact’ – as entirely responsive to evil and/or oriented towards escaping the consequences of moral law. Grace thus functions in opposition to Law and can’t help but appear subversive to Law, both because it helps the offender to escape just consequences of his or her offence, and even more deeply, because in its operations Grace appears to appeal to a higher good not captured by Law. If Grace is conceived within an a posteriori opposition to Law, then, as an un-lawful action, un-rule bound, it becomes difficult to distinguish from randomness. If it is conceived as an appeal to a higher, mysterious, Law, it becomes destructive of our operative conceptions of justice. This is a problem that perversions of Augustinian theology have fallen into regularly. 1. Grace is bound up with God’s eternal freedom to give himself in love to whomever he finds to love – a freedom conceived as potency rather than randomness (this fact being established in the life and presence of Jesus). 2. This freedom to love is also capable of expression in law, not as God’s obedience to a higher morality, but as an expression of his indefectible potency. (God’s freedom to constantly love whomever he finds to love is both the potency and goal of law). 3. Grace, then, doesn’t overthrow the law but flows from the same foundation in God’s freedom that underwrites the goodness and power of the law. 4a. It is the severing of both law and grace from the personal freedom of God that makes both Platonic/Stoic and Epicurean/Existentialist conclusions about moral action conceivable. 4b. It is the fact that we inhabit a world where we have a natural inclination to deny God’s existence which makes Stoic and Existentialist conclusions believable. 4c. It is the fact that these two sets of opinions are so thoroughly opposed and have been in unresolved struggle for millennia which makes little Existentialist skirmishes (like the Coens’) entertaining. (seriously, that would be cool! ).